In handling complaints, the Energy and Water Ombudsman Western Australia considers what is fair and reasonable in the circumstances, taking into account good industry practice and relevant law. Has the electricity, gas or water services provider been contacted? When you first contact us, depending on your complaint, we may provide you with information or advice. If you have already attempted to resolve your complaint with the electricity, gas or water services provider, it is likely that at this stage we will refer your complaint back to a designated contact officer at the electricity, gas or water provider to allow them another attempt to resolve your complaint. If your issue remains unresolved after it has been referred back to the electricity, gas or water provider, or if you have already made extensive attempts to resolve the matter but without success, we will determine what further action is necessary. We may decide at this stage that the electricity, gas or water provider has acted fairly and reasonably and that your complaint is not substantiated. If so, we will advise you in writing that we will take no further action with your complaint. Alternatively, we may decide that further investigation is warranted, and we will advise you that we will be investigating your complaint. If we investigate your complaint, what can you expect to happen? If your complaint is investigated, we contact the electricity, gas or water service provider to get more information about your concerns. We may also contact you for more information. We consider all the relevant information and make sure you have had an opportunity to tell us your side of the story. If we need to seek independent technical advice we will do so. There will be no cost to you, as the Energy and Water Ombudsman Western Australia is a free service. We try to investigate and resolve complaints in a timely way, but sometimes more complex matters take some time for us to consider all the information provided by you and the electricity, gas or water service provider. We will contact you by phone or email during the investigation when there are developments in your case, and if your complaint takes longer than usual, we will keep in contact with you to inform you about the progress of our investigation. You can also contact the case officer handling your investigation to enquire about its progress. During the investigation, we look for opportunities to resolve your complaint by agreement between you and the electricity, gas or water service provider. If you agree to a resolution, we will stop our investigation and close your complaint. 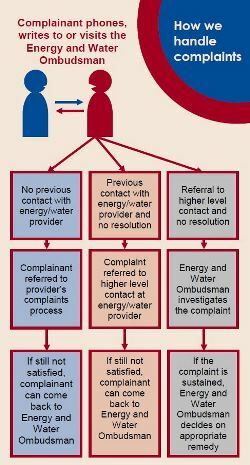 If, at the end of an investigation, the electricity, gas or water service provider cannot agree on a resolution with you, the Energy and Water Ombudsman Western Australia will either determine that your complaint is not substantiated and take no further action or make a binding decision on action to be taken to resolve the issue. You will be informed of the outcome in writing. You will be able to either accept or reject the binding decision, however it will be binding on the electricity, gas or water provider if you accept it. The Energy and Water Ombudsman Western Australia has the authority to make binding decisions up to a value of $20,000 or up to $50,000 with the agreements the electricity, gas or water services provider. To read a pdf, you will need Adobe Acrobat Reader, which can be downloaded for free from Adobe at https://get.adobe.com/reader/. Find out more about Requesting a review of the handling of a complaint to the Energy and Water Ombudsman.